By the end of the 20th century, gravestones in the East Falmouth Burying Ground were badly deteriorating. Inscriptions on many of them were unreadable. In 2006 the John Wesley United Methodist Church applied for and received $27,650 from the CPFund to hire a professional cemetery conservator, Donna Walcovy, to repair and restore all 133 gravestones set between 1842 and 1908. The East Falmouth Burying Ground is east of the East Falmouth Post Office on Route 28, extending through the block to Annette Avenue. Established in 1844, it was deeded to the East Falmouth Methodist Church built in 1849. The church was open to all residents of East Falmouth, which comprised members of many sects and faiths, including Quakers and Portuguese Americans. The burying ground was and continues to be the first burial ground for Portuguese and Cape Verdean settlers. Its 133 gravestones include those of veterans of the War of 1812, the Civil War, and World War I. The last burial there was that of Kathleen Tobey in 2000, a descendent of Thomas Tobey, one of the earliest East Falmouth settlers. When the church burned in 1924, ownership of the burying ground was transferred to the Falmouth Methodist Church, now the John Wesley United Methodist Church. The work included restoring or repairing the slate, marble and granite gravestones, clearing the area of invasive species and debris, major landscaping, and repairing and replacing the wooden rail fencing. The project preserved and protected an historical and cultural element of the Falmouth landscape and built environment. The Falmouth Genealogical Society, the Falmouth Historical Society, and the East Falmouth Village Association collaborated in the effort and the Genealogical Society was able to improve the information on its website about the Burying Ground. Falmouth Community TV subsequently made a documentary about the Burying Ground that is used to teach history to students at the East Falmouth Elementary School and available for use by other schools. The work was completed in 2010. The John Wesley United Methodist Church has established a Perpetual Care Fund for continuing preservation, restoration and improvements to the cemetery. The Town provides routine care and maintenance. 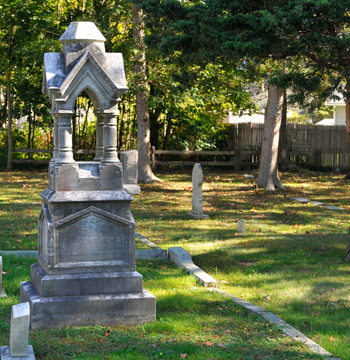 In 2011, the John Wesley United Methodist Church applied for and received $4,620 from the CPFund to have cemetery conservator Donna Walcovy treat all 68 marble gravestones in the East Falmouth Burying Ground with new products proven to arrest the deterioration of marble from weather and acid rain. These gravestones mark the final resting place of town fathers and veterans of the War of 1812, the Civil War and World War I. The Church established a Perpetual Care Fund for the continuing restoration and preservation of the burying ground. The Town provides routine maintenance and grounds keeping.